Deadly Lullaby: A Thriller is published by Penguin-Random House and its mystery and suspense division Alibi in the United States and Canada. Calmann-Lévy has translated Deadly Lullaby to French and will be published as a hardback, paperback and eBook in France in September 2016, and has paid McClure to write the sequel, currently titled The Slow Dawn. Euromedia Group is translating and will publish the novel in the Czech Republic, and Ikar is translating and will publish it in Slovakia. 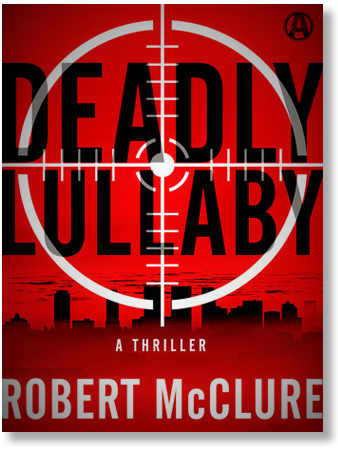 In addition to Deadly Lullaby, Robert McClure has published several crime fiction shorts which have been published in ThugLit, Plots with Guns, Mudrock Stories and Tales, and Hardboiled Magazine. Two of his shorts have been recognized by Best American Mystery Stories (BAMS), edited by Otto Penzler and a guest editor. McClure’s novel, Deadly Lullaby, is based on the short story, My Son, which was recognized by BAMS as one of 20 best crime stories in the United States and Canada and reprinted in BAMS 2009 edition. My Son captured the attention of New York literary agent, Nat Sobel, Sober Weber Associates Inc., who talked McClure into turning the story into a novel. BooksChatter met up with McClure to get the back story on the inspiration and origins of My Son and Deadly Lullaby and posted the interview here. To read more about McClure’s short shories, click here.